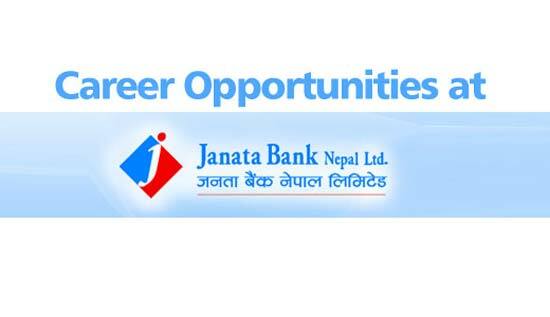 Janata Bank Nepal Limited announces vacancy for the post of IT Officer. > Database Oracle and MS SQL. > Having concept of Core Banking System software. > Network management and Hardware management. Qualification: Graduate with minimum 50% marks, preferably in IT and computer science. Additional programming skill will add value. Experience: At least 2 years of experience in programming/ IT sector. Candidates having software skill on banking/ financial applications shall be given priority. Age: Minimum 21 years and should not exceed 35 years of age (on the application deadline date). Applicants must mandatorily disclose their age and marks/percentage/CGPA for each level of degree from SLC/equivalent onwards. Only short listed candidates will be called for further selection process(es). The Bank reserves the right to accept or reject any/all applications without assigning any reason whatsoever. Canvassing at any stage of the processes shall lead to automatic disqualification.